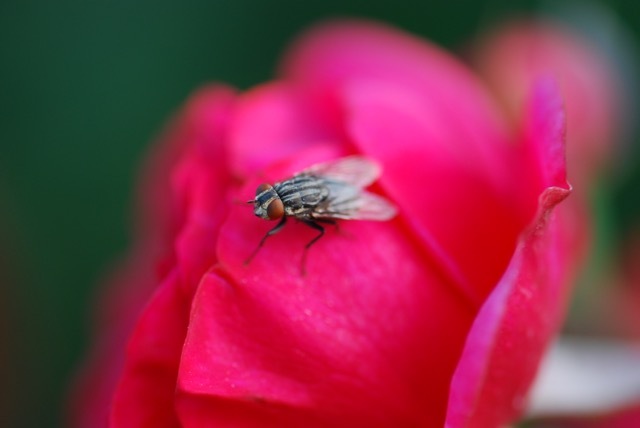 What happens when you send an entomologist to visit a rose garden? 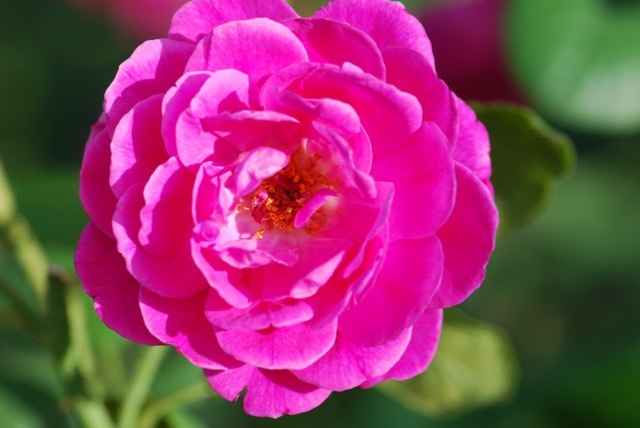 There will be some photographs of roses, of course. There will be even more photographs of insects. 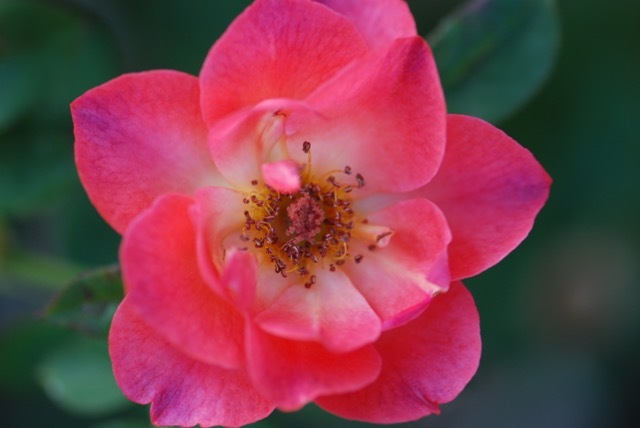 Isn't the contrast between the dark red rose and the light green aphids striking? 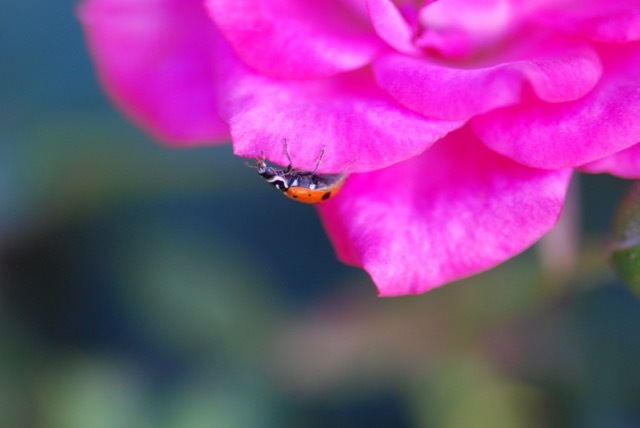 If there are aphids, there will be lady beetles.The adult in this photograph is a convergent lady beetle. 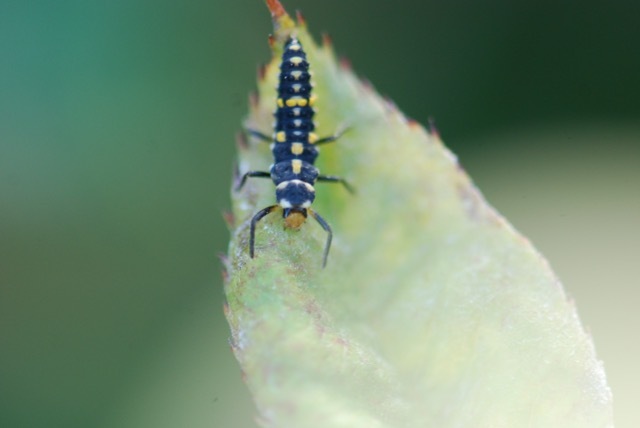 And lady beetle larvae. This one is an ashy gray lady beetle larva. 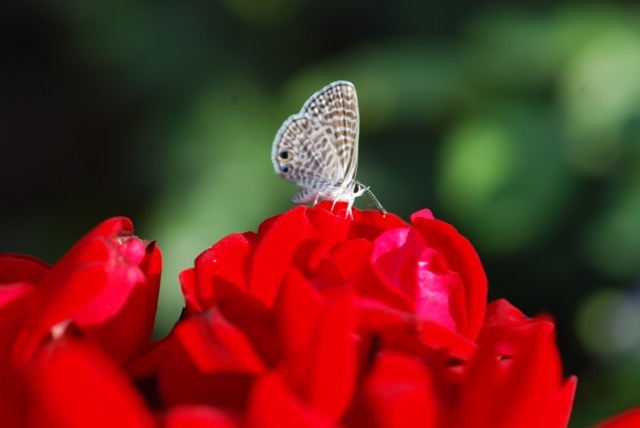 It is searching for aphids to eat. The larvae of the green lacewings also eat aphids. This green lacewing egg looks like it might already have hatched. The fly might have been attracted by the aphids, as well. Flies will eat the honeydew the aphids release. 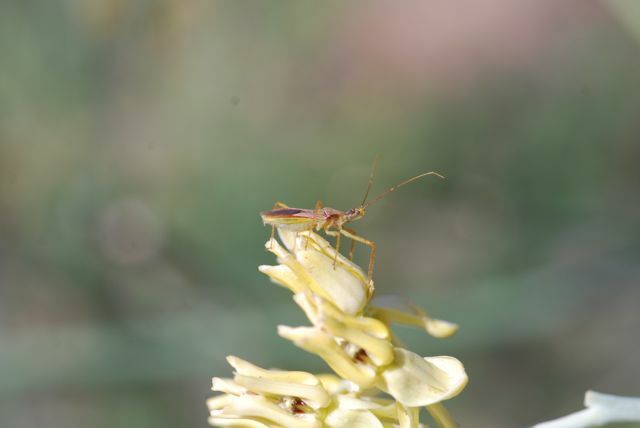 The assassin bug was probably interested in the bigger insects, like the fly. 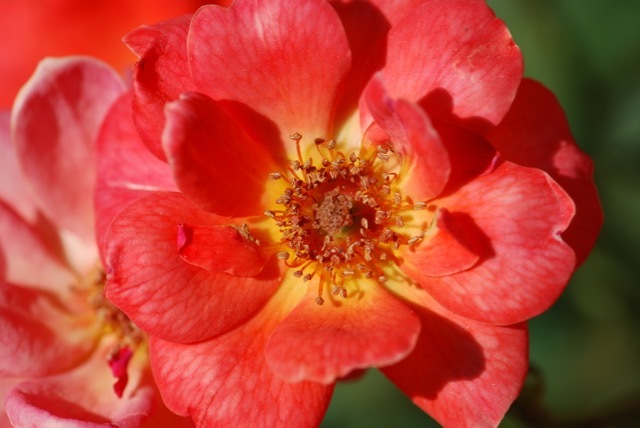 So, yes an entomologist will spend more time looking at insects, but he or she just might enjoy the roses, too. 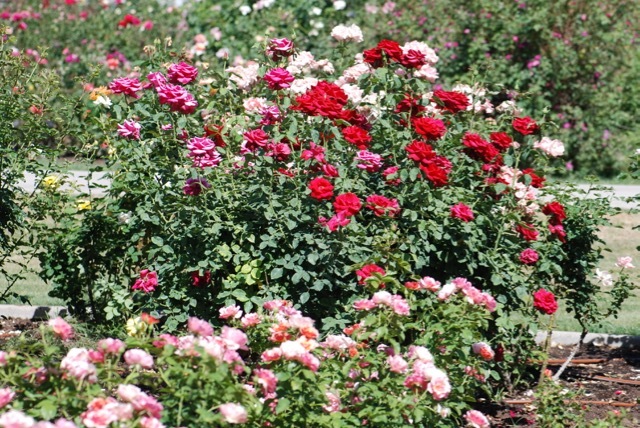 Roses and insects provided by the rose garden at Mesa Community College. 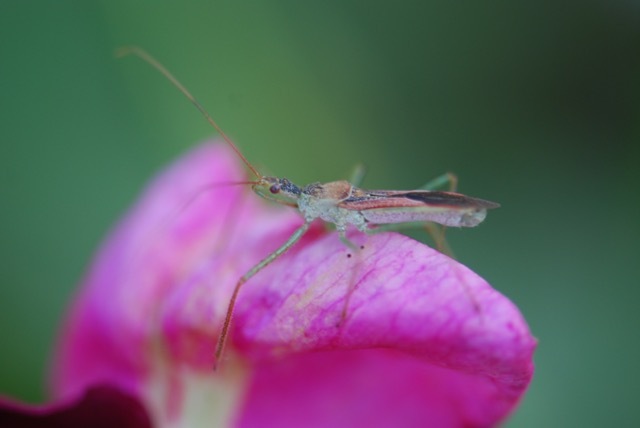 Did you guess the identities of the milkweed insects from last week? Let's check. 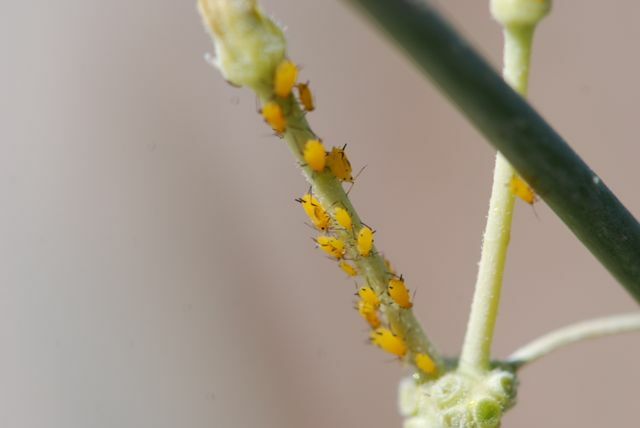 The yellow-orange insects on the stem are aphids. 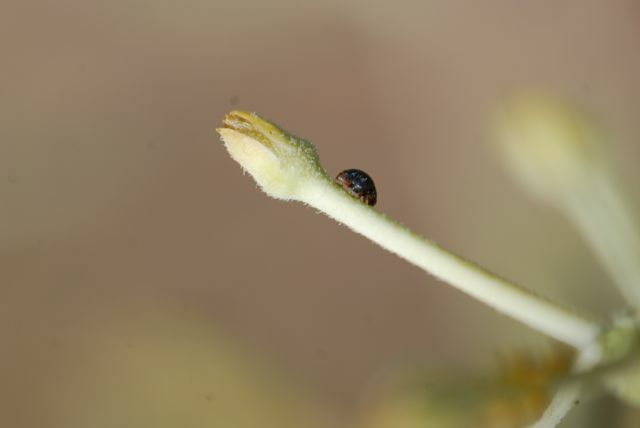 More specifically, they are the oleander aphid, Aphis nerii. 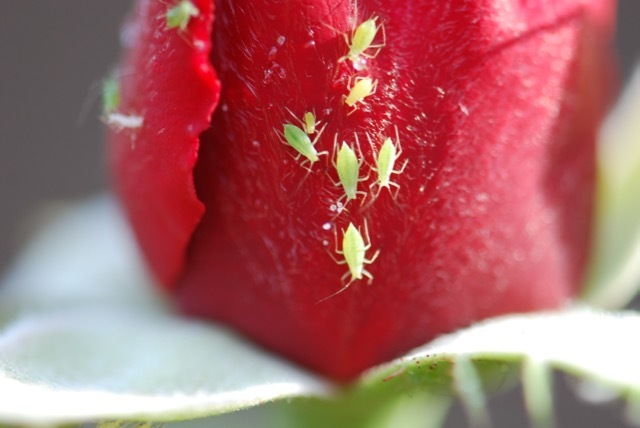 Hint: Aphids are the ones with two "tailpipes" or cornicles on the back. 2. The red and black one insect might be hard to tell from this angle, but it is a true bug. 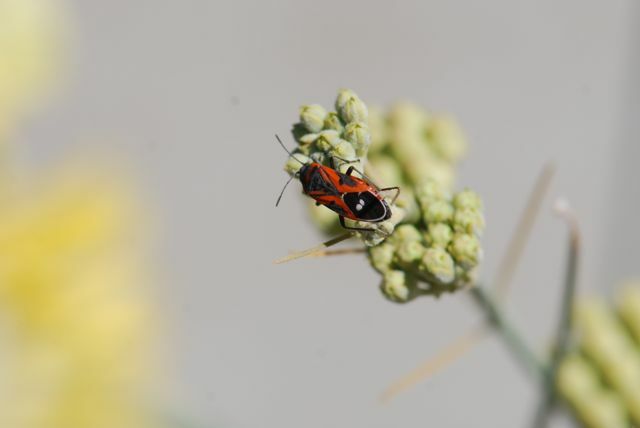 A little one with two white dots in the wing is a small milkweed bug, Lygaeus kalmii. 3. This one was tough because the photograph isn't very close. It is an assassin bug, Zelus renardii. It is probably waiting for a bee or fly to capture. 4. I think everyone recognized the praying mantis. 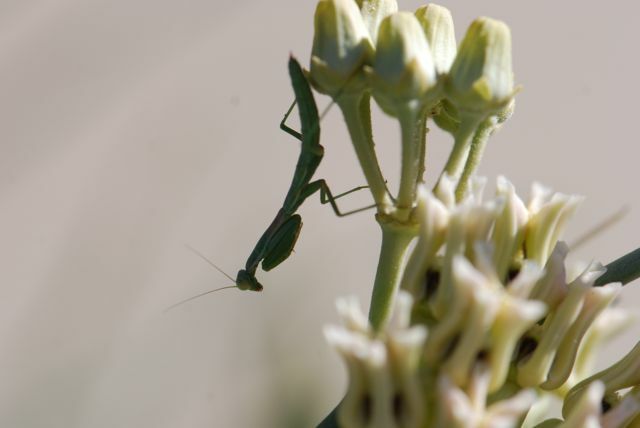 In this case, it is the Mediterranean mantis, Iris oratoria. (See previous post). 5. This one is tricky. Cirrelda correctly recognized it is a lady beetle. 6. 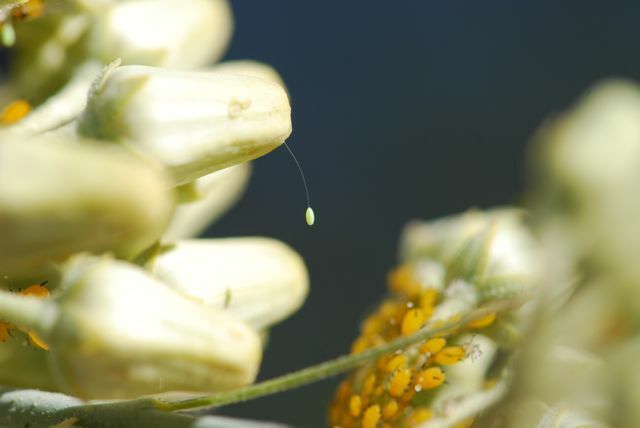 The pale green oval at the end of the hairlike stalk is the egg of a lacewing. (Life cycle in previous post). 7. 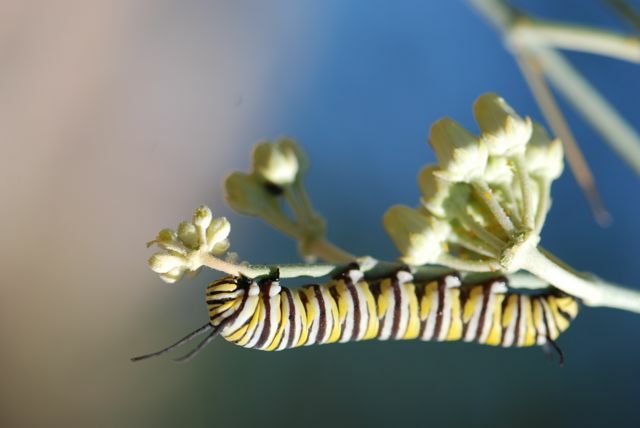 The cute striped caterpillar will turn into a monarch butterfly. At this time of year, the butterfly will probably migrate farther north to lay its eggs on another milkweed plant. We're glad it stopped by. Today's find is the egg of a green lacewing. Lacewing eggs are pretty easy to identify because they are on the end of a hair-like stalk. 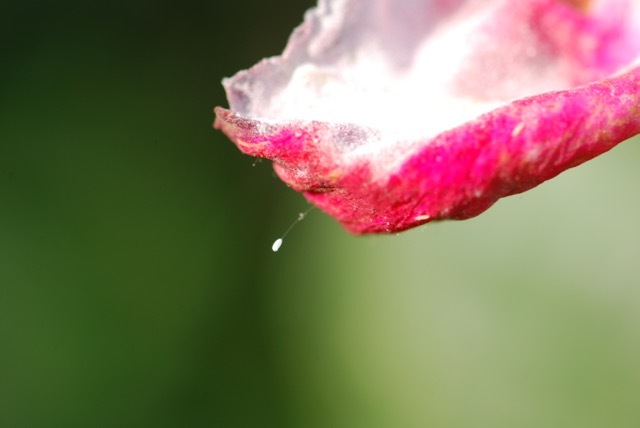 A few months ago I found a good example of a lacewing cocoon. 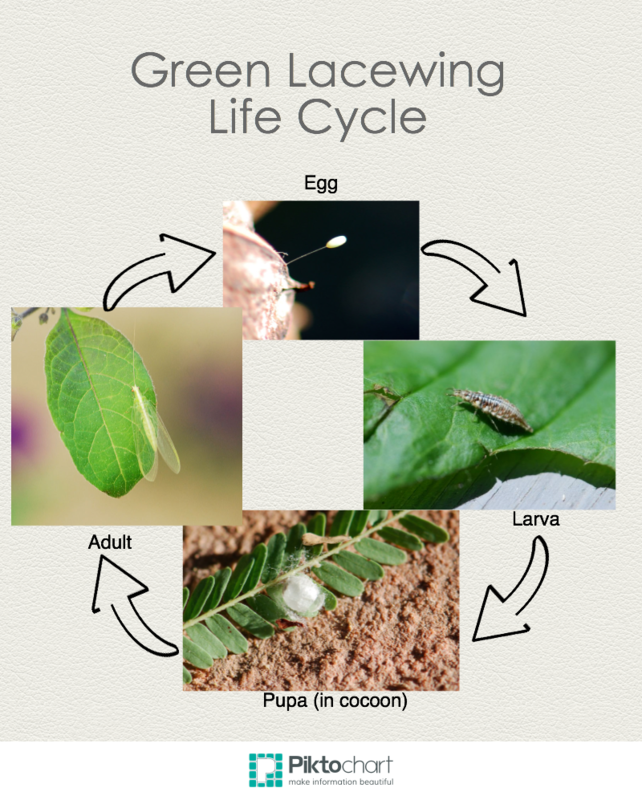 Time to make an green lacewing life cycle infographic! 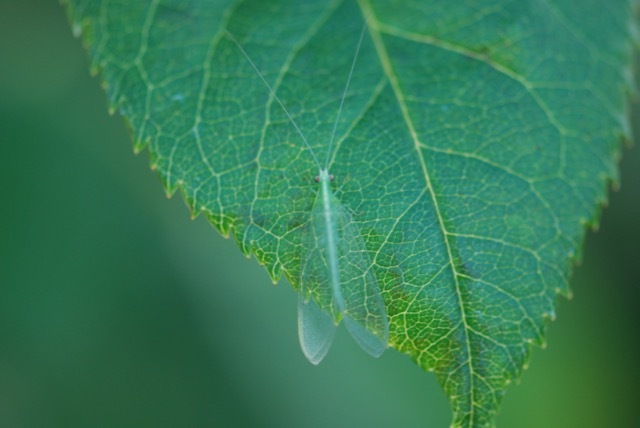 Green lacewings are considered to be beneficial insects because the larvae are predators of scales, whiteflies, aphids, small caterpillars and other potentially pesty insects. The pupa stage forms within a cocoon that is usually hidden on a branch or twig. 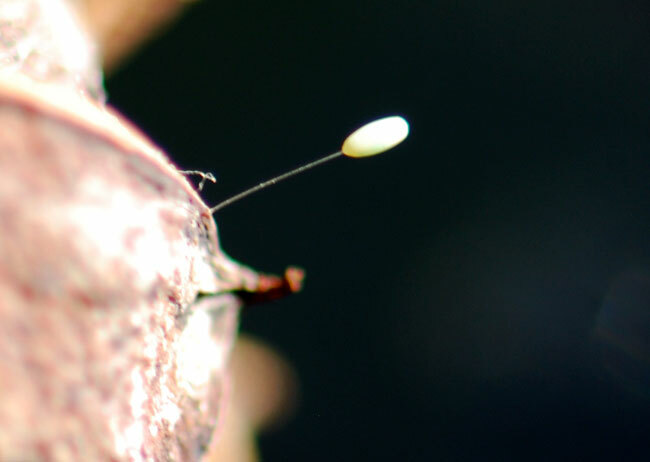 The lacewing cocoon may be mistaken for a spider egg case because the silk resembles spider web. The adults are light green with delicate wings and golden eyes. If disturbed from a leaf they will fly during the day, but are more active at night. The females generally lay their eggs at night. We'll probably be seeing more and more of these as our weather warms and the wildflowers start to bloom. Just a few more weeks.